Brew Facts: Bigfoot is brewed in open fermentation vats over six days. If you have a bizarre interest to see the full fermenting process done in time lapse like I do, check out this video. For the barrel-aged version, it was aged on Kentucky oak bourbon casks for two years. Appearance: A pour into a snifter and I’m reminded just how surprisingly light in body, color and soul Bigfoot is (for a Barleywine). Like standard Bigfoot, the glass is a glowing red bulb with amber tinges the color of insect preserving resin. It’s a bit like a thinned cherry cough syrup. A swirl finds a hula hoop of suds sliding down the glass edges on a clear slick of oil and miniscule bubbles spinning on the surface in thin crescents. The head on Bigfoot is no more than a dusting with clarity you can read a book through. Aroma: Held to the nose, astringent alcohol collects in the nostrils and continues a rolling burn even after the glass is pulled away. Sweet brown sugar, the faintest ghost of vanilla, honey, and malts mix with the tangy, acidic whiskey and wet wood that doesn’t quite hit the pickly/dill stench of other clumsy whiskey-aged beers (there is the slightest hint of it as it warms). An undercurrent of toffee holds everything together to keep this teetering on the line between straight whiskey and the fact that it’s actually a beer, albeit a boozy sweet one. Based purely on aroma, I can say that barreled Bigfoot is a greater success than many other whiskey-aged beers I’ve tried. Taste/Mouth Feel: Beer finds mouth and I find a liquid that is on the cough syrup side, the alcohol doesn’t pack quite that wallop, that doesn’t stray too far from a medium body to be overly indulgent. For what this beer is, I’d say it’s about right. A brief bit of the mildest of earthy, toffee sweet starts off, but is quickly beaten, pummeled, and broken by spicy whiskey, a rippy/dirty bitterness that is surprisingly potent, and the flavor of burnt that is closer to char than toasted marshmallow. The finish is oddly harsh, bitter, and frankly unpleasant. It isn’t harsh enough to make drinking this a chore, but it isn’t making me want to go back for more either. With the whiskey powerful and the beer timid, it’s a combination that flummoxes me. But then, I transferred the beer from a snifter to a Teku glass with a nucleation point*. There are a few beers that I’ve had where the glass type has made a huge impact (AleSmith Numbskull comes to mind, another hopped Barleywine). Through experimentation, I have found that glassware can alter beer flavors, emphasizing some aspects and diminishing others. With this one, the gulf between snifter and Teku is the grandest of canyons. Out of the Teku, the whiskey fades to the background, allowing the elements of Bigfoot to shine with tasty results. The toffee sweetness comes through far more as does a lovely vanilla and coconut note. The mouth feel fluffs up and backs off the burnt toast for a lightly warmed brown sugar on the finish. While the overly assertive whiskey does blend in a bit more, it blends out the hoppier qualities of base Bigfoot. Regardless, it’s an all-around better experience. To make sure that I was not imagining things, third-parties were given the same beer in new, clean glasses without any influence or guidance from me. Both independently had similar experiences to mine and found the changes just as surprising. Final Thoughts: On first sip, my mind was set on giving this a firm pass, especially at $20 a bottle. The burnt toast and aggressive bitterness (not hop bitterness mind you) is a massive turn off in a Barleywine for me. But, a simple change refocused my taste buds and I found a rather enjoyable beer swimming in vanilla, brown sugar, coconut, and whiskey heat, though the hoppier elements of Bigfoot are lost. 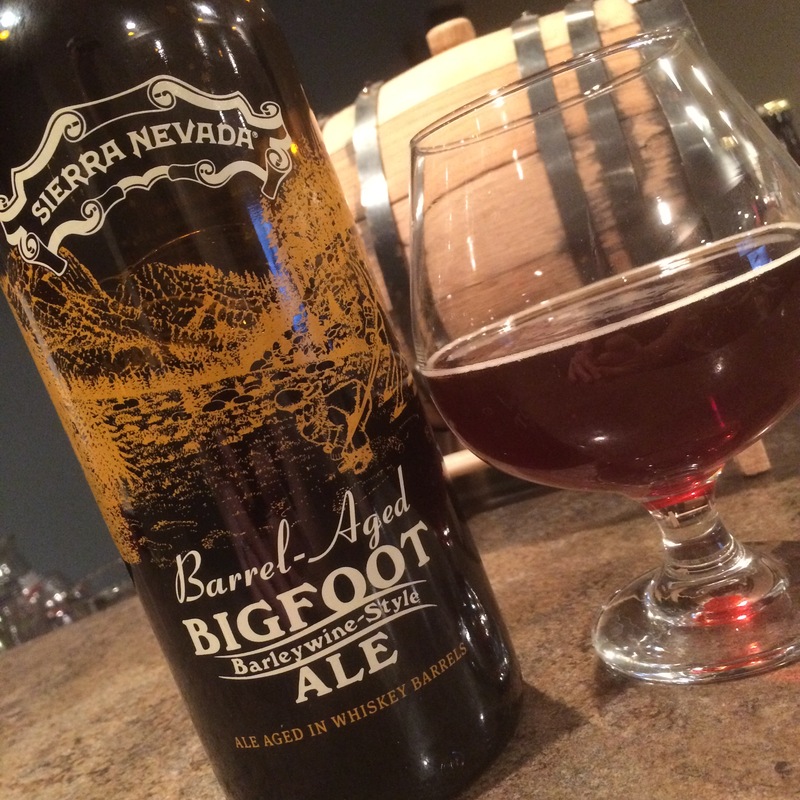 Personally, I find that the hand is heavy on the whiskey barreling and Bigfoot lacks a counterbalancing malt presence, but not every beer is brewed for me. While I’m lukewarm on whiskey barrel aging in general, this is one of the more successful I’ve had. Recommendation: Whiskey lovers and people willing to experiment for the best experience, give it a shot. * – A nucleation point is a laser etched area on the bottom of a glass that creates a designed imperfection which invigorates the bubbling process. This bubble increase affects the aroma and increases head retention. nothing surprising these days how companies try to sell products even naming them after mythical creatures. Bigfoot must have a desire to drink that whiskey. Straight to the cellar with this one.